CALLING ALL BUILDING OWNERS, ASSET MANAGERS, ENGINEERS, FACILITY PROFESSIONALS AND PROPERTY MANAGERS! 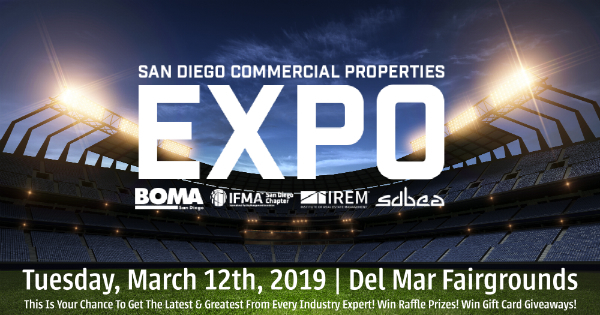 Register today for the San Diego Commercial Properties Expo! WE are combining FOUR premiere industry organizations to bring together regional experts, resources and suppliers from BOMA, IFMA, IREM, and SDBEA! This expo represents the best of the best in the commercial real estate industry - you don't want to miss out! • Tuesday, March 12, 2019. 3PM to 6PM. You guessed it - Happy Hour! • Wyland Hall at Del Mar Fairgrounds. Same place as last year! These industry experts will help you do your job better! Prizes, prizes and more prizes! We’re giving away a ton of raffles! Remember - registration is free until March 10th. After the 10th it goes up to $50. So, register today to attend! All those acronyms…here’s what they stand for: Building Owners & Managers Association, International Facility Managers Association, Institute of Real Estate Management and the San Diego Building Engineers Association. Note: Associate Members and Prospective Associate Members (vendors/suppliers) must have a display booth to attend. Any associate member or prospect will be removed from the FM registration list and will not be able to attend.